The correct placement is of the litter box is extremely important. The general rule is that you should have one more cat box than the number of cats you have. One cat = 2 litter boxes. Two cats = 3 litter boxes…etc. With a large number of cats, you probably should have two or three extras. Some cats will not share a litter box with other cats. Some cats will not use the same litter box for solid and liquid waste. A Private Location A private area is best due to the cat’s fear of being attacked when their guard is down. A guest bathroom, a closet, or a guest bedroom are all excellent choices. Don’t forget to leave the doors to these locations open. If space is an issue, consider using a screen in the corner of a room to create some privacy. Don’t put the Litter Box near Food Don’t put the litter box near food for sanitary reasons. Cats like to keep clean, so try to locate the litter box somewhere other than near the cat’s food and water. Multiple Level Homes = Multiple Litter Boxes Most cats will move freely up and down stairs. However, forcing young and older cats to climb stairs may lead to litter box avoidance. Nature gave cats incredible athleticism. The love to leap, jump, and run. Toys and regular playtime are important so because your cat needs stimulation to be happy and healthy. Playing uses energy, and provides mental and physical stimulation. Using interactive toys can create a chance to bond with you. Small cat toys are excellent, because they mimic what a cat is naturally attracted to instinctual. Playtime can be a great time for bonding with your cat. A wand with a dangling toy or other types of interactive toys are outstanding for this purpose. There are lots of really cute cat toys available. Toys such as sisal-wrapped toys, plastic balls, small catnip toys, etc are all excellent choices. Some come with bells and some do not….both work well. It is a good idea to supervise when your cat plays with a toy and to remove any toy that is torn of broken. Keep your cat interested in their toys by rotating their toys weekly. Offer only a few at each play time. Have a large variety so you can always keep your cat interested. If your cat has a favorite, you might want to leave that one out all the time. Provide toys do different things, are made of different materials and are of different shapes. Many of your cat’s toys should be interactive. This kind of play is important for your cat, as such play continually strengthens the bond between you and your cat. A leading manufacturer of suitable cat toys and other pet supplies at affordable prices is www.PetTrain.com. Check them out by clicking on their name. Catnip is safe, and your cat won’t get addicted to it. Various cats are affected differently. A small percentage of cats are not attracted to it….others become very mellow around it …some other will play too aggressively when stimulated by it. 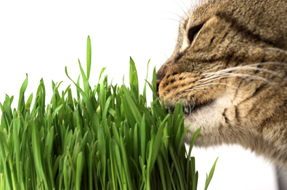 The great majority of cats love it and are very attracted to it without any problems.